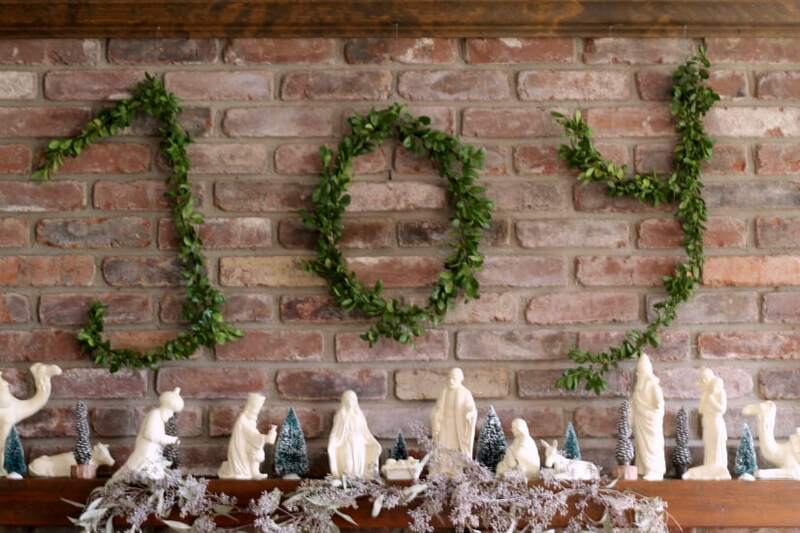 Learn how to make wire hanger boxwood letters that work great at Christmas or really any time of year, with simple materials and little time and effort. This project, wire hanger boxwood letters, couldn’t have been easier and it cost me nothing to make. I have this somewhat awkward wide space above my mantel that needs something, especially at Christmas. This year I thought I’d hang the word Joy, in big letters, to complement the space. I couldn’t decide if I should pick up some paper mache letters from a craft store, or try to make some myself with fresh greens. Of course, fresh greens won out, and I used boxwood which lasts a long time. All I needed was a foundation to adhere the boxwood too, so I used good old wire hangers. Sprigs of Boxwood – pine and cedar work well too. Start with your hangers. I used black so that the wire wouldn’t show as much with the boxwood. Shape your letters by twisted the hangers open and using your hands to bend them into the letters you want. I knew I wanted mine to be very large so I used one hanger for each letter, but you could easily cut the wire to make smaller letters. Next, gather sprigs of boxwood in 4-5 inch sprigs and starting with one use paddle of floral wire to attach the stem to the wire letter, wrapping several times to secure it. Add a second sprig of boxwood slightly overlapping the first, and continuing to wrap the wire paddle around it and the hanger. Repeat until the entire hanger is covered with boxwood. Within minutes the J is complete! Here’s the finished project. I’m using this project on the brick above my mantel, but as you can see, the letters would look really pretty on a white wall. Still, I think it fills the empty space well and I couldn’t love the message more. I’m just wondering how long do the boxwood leaves last before you have to pick new branches and attach them to the wire again? By the way it looks absolutely amazing. We keep our house pretty cool in the winter but as I recall the leaves stayed on their for many weeks. They did start to lose their color a little maybe after a couple of weeks, I’m not sure, but they didn’t fall off. I LOVE this use of wire hangers! Love it!! I’m asking readers to share their Coat Hanger projects at the Create with Me party tomorrow. I hope you’ll come by my blog, Love Create Celebrate, and share this one! Your JOY boxwood letters are amazing! I love the ease of your project and how wonderfully, festive it is. I love anything thats boxwood, so I may also have a bias. 🙂 I’m including your project in my DIY Christmas Wall Art round up tomorrow! Also pinning and sharing your great idea. Thanks Stephanie, fellow boxwood lover! Patty, this is such a unique and beautiful idea! I love it. Pinned!! And I love that it’s so easy and can be done with anything you like all year too! These are great! Thank you for sharing your how to!… I think I’m going to have to whip some up! It’s pretty simple but I like the way it solved my issue. Thanks for stopping by! What a cool idea! Wire of all things… so clever and beautiful! Oh My Gosh…this is fantastic. we have always wanted to know how to make Boxwood letters and can’t thank you enough for your tutorial! “JOY” looks beautiful hanging in your home! Thanks for sharing. Oh, I love this! So pretty – pinned it! What a great use for wire hangers! I love this idea! Can be used for so many things!